It was late in the afternoon when we headed over the the Alan Marchant aviary. Alan greeted us at the door and out came his German shepherd a large beautiful well behaved dog. We sat down for tea while I listened to Dave and Pam catch up on old times in the hobby when they lived in England. It was immediately apparent that Alan had a strong personality with a warm touch. I instantly respected him once the discussion of birds came about. I was cold and the light was beginning to fade. 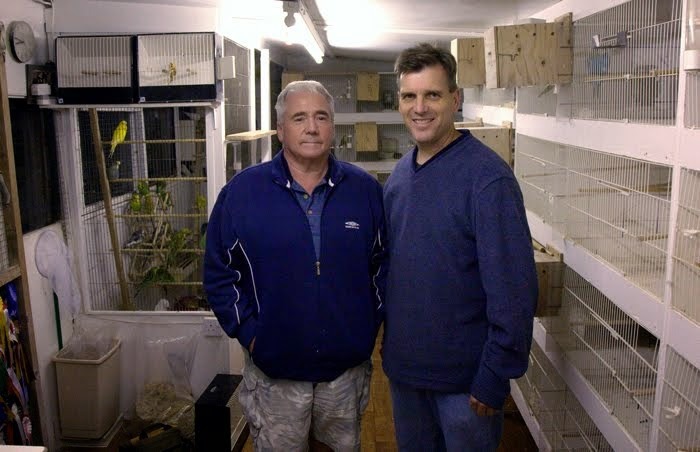 Alans aviary is in the back of his house that adjoins an incredible brick back patio. The main flight borders the back of the patio and steps down a level to the entrance. 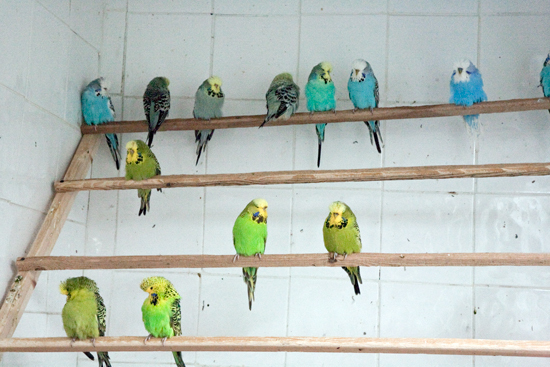 It wasn't a large aviary but well managed. 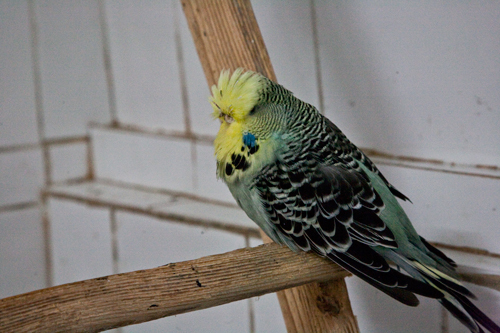 As we walked into the aviary it was fairly dark. 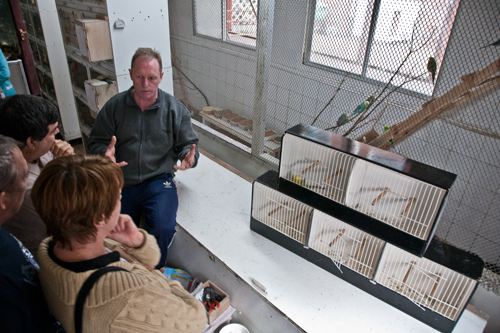 We settled in and Alan began to bring birds down to show cages he had on the table. It was so dark that I really had a difficult time trying to get some quality pictures. 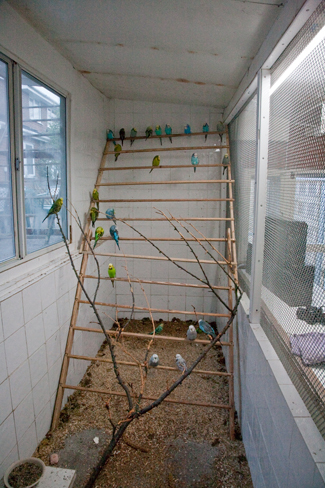 His aviary was typical with the breeding cages adjacent to the flights where the majority of the light shone through. 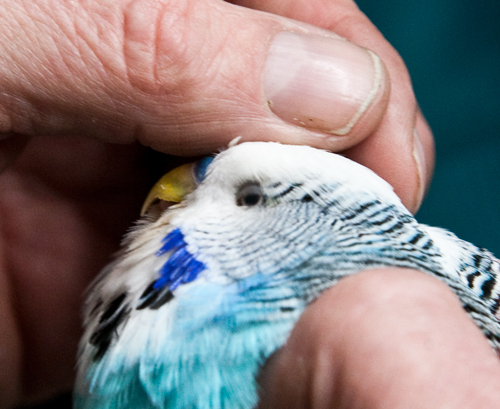 Looking at the birds as they were placed in the show cages had a huge impact on me. 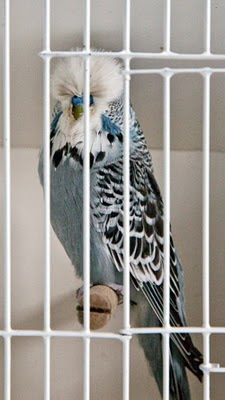 The style of bird and its size and feather direction were at another level. I have not seen anything like it ever and in some features even at the world show. 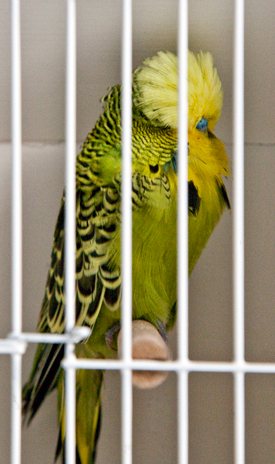 The width of the head was easily the length of 4 bars on the show cage. The back skull was very thick. 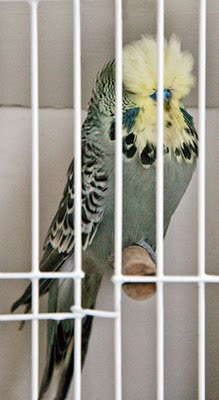 His birds seemed to fill the show cages. I asked if I could continue taking pictures in the indoor flight, which I did. The consistency in the birds was very good, better then I had seen to date. Alan is very passionate and knows where he stands in the hobby. 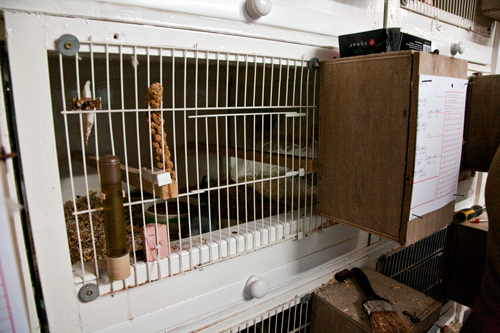 We walked into a 2nd room of his aviary where he housed his younger birds. Alan caught up a bird and held it closely for us to see the iris ring in the eye. The white ring was wide and almost wild. 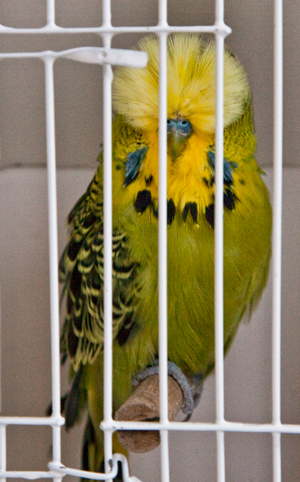 This is a bird that is fierce and ready to breed. It was a reminder of another thing to pay attention to. He has a huge demand from all over the world for his birds. We discussed the possibility of buying birds from his aviary however he would not do so due to an agreement with a breeder here in America. Frankly the discussion came to a point that he stated he wouldn't even care if his birds were shipped to the states. Alan has not been showing birds that I am aware of which made me think that he is ahead of the game considering the demand which he receives. He told us that he has never sold a bird for more then 300 pounds. The difficulty of buying birds from such breeders is the high cost that many breeders are selling birds for, plus the high cost of bringing them in to the United States. The quarantine cost, shipping and vet bills and exchange rates are tremendous. That said some importers are now charging exorbitant prices in order for us to buy the quality here. 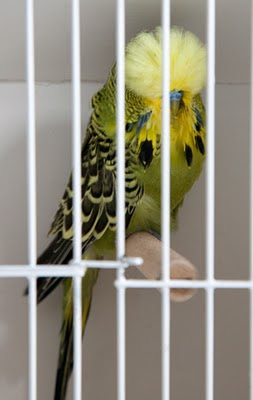 The question we have is can I bring in birds of high and better quality then I can purchase from someone here willing to sell that same quality if it exists? 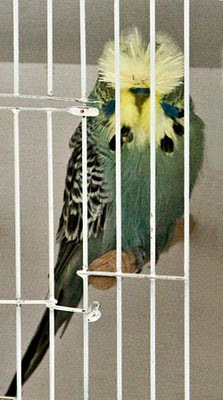 The risk is very great when you consider the stress a bird goes through, in order to survive let alone breed for you. You can put up 1000s of dollars and not reap the benefits you put forth in the 1st place in order to progress in the hobby. The question that remains is: What am I willing to spend to advance my position in the hobby? Speaking from my position of income I am limited in this endeavor, however working inside of a small group it might be possible if we have an agreement in writing where we share the offspring thus decreasing the risk involved. 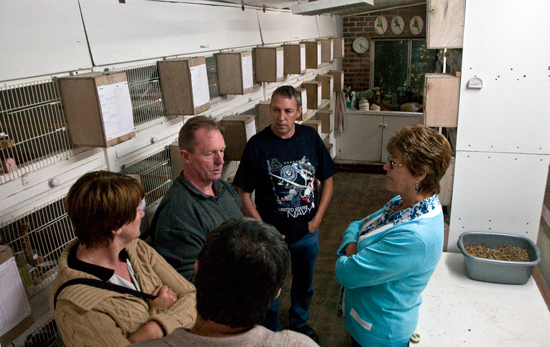 The discussion of an inner circle came up on our trip about top breeders that only share birds inside that circle. 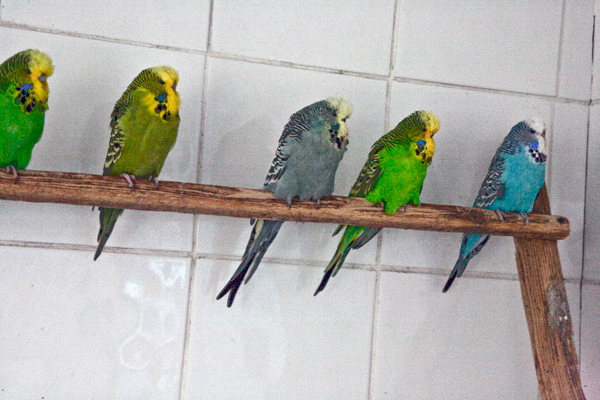 Sometimes there are exchanges of offspring or a simple swap of birds. When you look at who is winning at the top shows the majority are the rich. Often its these breeders who do not last. Some do not have the skills to continue to achieve what they set out to or they achieve it and leave. I am not a fan of those who buy their way to the top. Maybe you could argue that anyone spending more then $1000 is buying their way. I guess that is determined on your income level. It is however possible to succeed by learning and paitence. 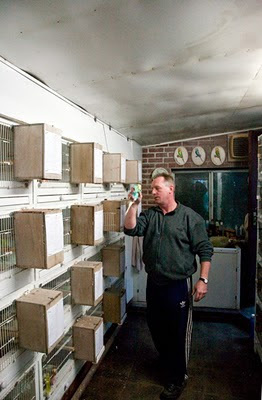 These are true stockmen who know every aspect of their birds, they have time and a plan to get there. That is the breeder I want to be, yet I'm always looking for opportunity. I have always felt that when money is taken out of the equation in this hobby it changes everything. Here in America our hobby is sparse and spread out, so when people have to travel hundreds of miles it limits the numbers of people involved. When we stick together the hobby benefits and it expands. 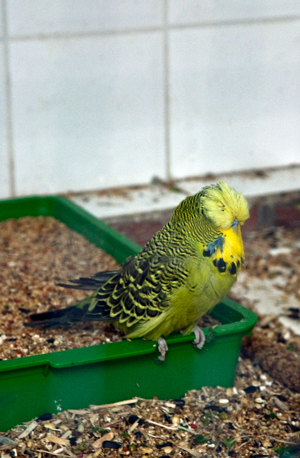 Many leave the hobby or never show and you notice the quality of their birds decrease. What are you doing I ask at your level for this hobby?